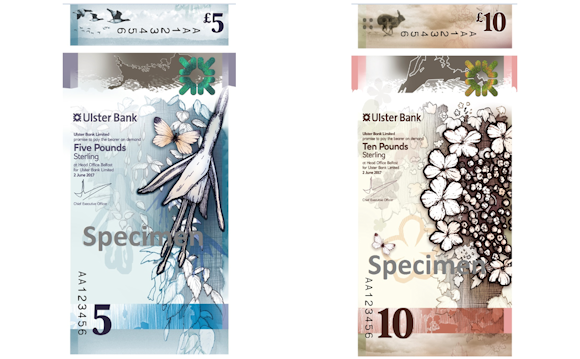 Ulster Bank revealed a new series of portrait style banknotes this week. The new design will be vertically oriented (portrait) and will be themed ‘Living in Nature’. The £5 note will focus on the sea and migration and features Strangford Lough and Brent Geese. The new £10 note will emphasise growth of agriculture and heritage, and will feature Lough Erne, Irish hare and Guelder-rose shrubs. A king scallop from Strangford Lough also features on the notes, as does an Ulster Glade potato. The polymer banknotes are expected to be issued in early 2019, replacing the paper £5 notes first printed by Ulster Bank in 1998, and the £10 notes first printed in 1990.